Door No. 1 was also awarded as Best Retro Bar of Western India by Restaurant India in 2018. Door No. 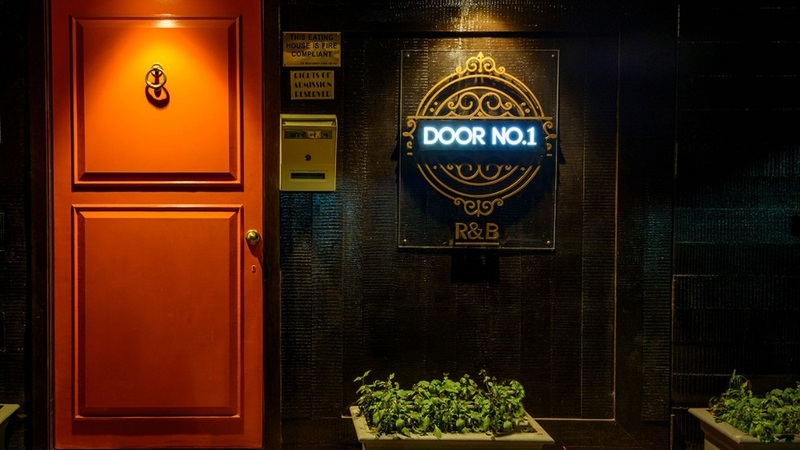 1 is a retro bar located at Bandra West, Mumbai. It’s an all-day dining experience where the traditional drinking experience is transformed into a magical pursuit of decadent entertainment. Mihir Bijur and Vishesh Khanna’s debut venture under the newly-formed S&S Foods, Door No. 1 mirrors their love for music and nostalgia. Flooded with retro elements, the eatery has a warm vibe, which makes it inviting and appealing to all its guests. What catch your eyes when you enter is - the classy yet homely interiors. Anuradha Arora Maniktala, Mihir and Vishesh’s sister-in-law, was largely instrumental in conceptualizing and overseeing the look and feel of the venue along with the rest of the family. A combination of vintage wall illustrations, installations and artwork give off the vibe of a journey of exploration. Be it the vibrant crowd-sourced Orange Library, which stores books of various genres, the 3D painted DJ console, which is impossible to miss, or the walls adorned with retro images reminding you of the golden days gone by. Mihir and Vishesh’s personal favourite is the gaming den which stacks up to a PlayStation, neatly packed in a suitcase and a range of childhood board games such as Chess, Monopoly, Pictionary, Scrabble, Sequence. Spread across an expansive area, Door No. 1 will remind you of the house you so want in Bandra. You enter the living room which has intricate collectables handpicked by the owners and their family. Take a long break and spend the day unwinding at the gaming den, or if you enjoy a faster-paced experience hop over to the bar to groove to some great tunes and enjoy one of their signature cocktails. An innovative and expansive bar sits at the helm of the restaurant, overlooking the comfortable furniture and seating area, which can accommodate close to a 100 people in totality. Best described as wholesome, luxurious with a true passion for retro, Door No. 1 forms an aesthetic balance through experimenting and creating new experiences for patrons. 2018 has been a great year for us. Along with hosting over 1000 schools, colleges and office reunions, we were also awarded 'Best Retro Bar of Western India' by Restaurant India. Apart from the fact that our events have gotten listed in the Top 5 and Top 10 of the country, we've also been consistently listed in the Top Mumbai Restaurant title by Zomato. Door No.1 is based on a house party because that’s where the idea came from. My business partner, Vishesh Khanna and I would often meet at house parties as no bar played the music we grew up to. At these parties, we realised that even strangers, who entered, connected so well on retro music that they'd end up becoming friends. After the 20th time of joking with each other about starting a bar and taking this nostalgia to connect to the city, we finally quit our corporate jobs one day and chose to follow our passion of building a mecca for nostalgia for an entire generation that has very limited social options in the country. We are a nostalgia place which caters to an entire generation, typically 30-70 years of age who have "been there, done that" in life. This along with retro music from the 50s to the 90s has helped automatically filter our crowd and has introduced us to a lot of CXO regulars and mid-professionals who don't look at the right-hand side column of the menu. Nonetheless, we've not priced ourselves really high and have constantly evolved our menu and pricing to finally set it in the right bracket. We get anywhere between 6,000-8,000 people per month which for a restaurant of our size is a decent number. The pivot of Door No.1 is nostalgia. We breathe nostalgia in everything we do - from decor to music to even food. We have a special section called 'Single's Faux Pas' which is all the dishes that we all have cooked up in the kitchen with whatever was available late night when we were studying in school or college. This was an instant hit as it is still our best-selling section. Apart from that, we have evolved both the prices and the dishes overtime after carefully listening to our audience. We've not priced ourselves really high and have constantly evolved our menu and pricing to finally set it in the right bracket. The elaborate bar menu pays a tribute to retro days and aims to associate with nostalgia. Premium imported spirits and domestic liquor have been used to create a range of cocktails and mocktails. The menu showcases international and local flavours with broad use of fresh fruits, purees and flowers. Some of the noteworthy drinks include Inner Peace a star concoction of Vodka, Cranberry Juice, Grape Juice and Mint syrup, Lemongrass Ginger Martini a delicious blend of Lemongrass, lime juice, vanilla vodka, diced fresh ginger and sliced ginger, Spiked Chocolate Milkshake a potent mix of dark rum, Kahlua, chocolate ice-cream and Texalins, a fusion of white rum, chardonnay, cranberry juice, orange juice and champagne. The visual demonstration is a large part of the overall bar experience which encourage interaction and engagement at the bar. For the teetotalers out there, they have ample choices such as Current Affair, Guava Spice, Energy Sunrise and Spice Girl. We, at Door No.1, are based around nostalgia as our pivot or essence of existence. Everything we do is based around this feeling, including our marketing. We don't believe in going big with ads and rely on building a big and tight community online which breathes the same passion for our music, vibe, and feel. In today's world of high online visibility, it is impossible to not be on platforms where your audience is. Apart from SEO and SEM purposes, these food-tech companies also help in connecting the user and the brand in a way which 5 out of 10 times results in a footfall. Apart from becoming a one-stop shop for online ordering, they are also amazing shouting boards to keep your audience updated on exactly what to expect when it comes to food, beverage, experience, events and vibe. What makes a Bar Successful? In the two years of our existence, we've never stopped learning. Each new face and each new day has taught us more about how people think and function. What moves them, what grooves them; we've realised that a bar is successful only if we understand the basic psychology of how humanity functions. It is encouraging to see more people taking the big move to come out of their comfort zone and start a restaurant. I personally believe this is one of the toughest industries and most under-rated. It is also encouraging to see the audience evolve with socially accepting dining out on a regular basis and going beyond just pricing software and rustic looks. The audience today is very well-informed and knows what they want.